A modern, renovated deck combines beauty and function to create the perfect entertaining space for family and friends. And for many families, being together means eating together. However, gone are the days of single purpose outdoor dining decks. The top deck designs of 2017 offer space for a plethora of activities, from hosting parties to providing intimate spaces for one-on-one conversation. The key to modern deck design is knowing how to delineate space for a specific function (one area for play, another for lounging). Here are some great modern design ideas to turn your deck into the perfect entertaining space. The deck is an extension of your home so the style needs to match. Older traditional houses with brick exteriors can be modernized with wood and steel elements. Wood, rock, teak, slate, and travertine stone are all beautiful materials that will modernize your deck. You want to create a harmonious blend with the outdoor setting. Consider consulting a designer for advice. 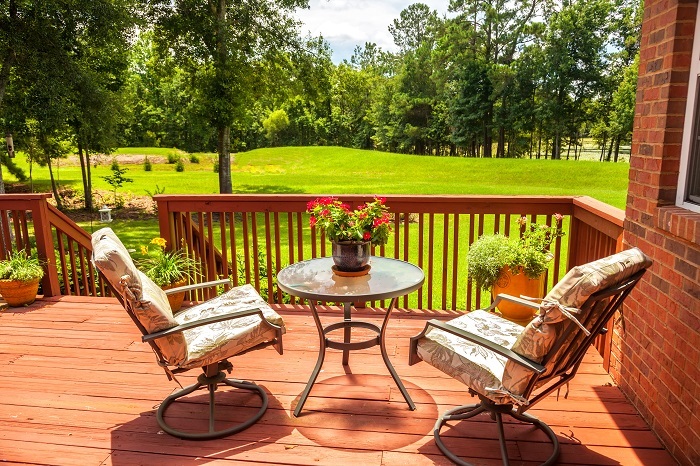 Tiered decks break up your deck into separate spaces with specific purposes. The top level can be an entertainment deck and the lower level a lounge space. Attach one of the levels to the kitchen with a walkout screen to quickly move food from prep on your counters to the grill. If you have a spectacular view, the diversity of heights offers different vantage points to enjoy the view. Try unifying the different spaces with similar color schemes. And, you can emphasize the separation of space by painting the stairs risers and railings a distinct color from the floors, like bright white for dark woods. A 360 view deserves a 360 deck to capture all of the beauty. This also offers room to delineate different spaces for different activities: lounging, sunning, grilling. Built in seating is surprisingly versatile. Not only is it great for guests to have built in bench seating, but it frees up space you would have used on clunky furniture. Add decorative pillows and outdoor rugs around the built in seating to create a lounge space. A railing should be safe and efficient, but that doesn’t mean it has to be boring. Glass or transparent slats keep from blocking a beautiful view and creates less separation from the outdoors. An affordable remodeling option may be to paint your existing balusters or replace them with ones that have an interesting centerpoint design. Or put iron railings between your posts for a cool, industrial look. You can balance hard edges and rough materials with flowered potter plants and light bright furniture. Adding lighting to your deck keeps you safe and allows you to keep the party going after dark. Replace current light fixtures with new ones that produce more light. Use solar markers on stair risers, and add lights to post fixtures to outline the perimeter of the deck. Install solar markers on the sunny side so they stay charged. Or, you can use strings of lights to create a beautiful perimeter. A canopy is a wonderful way to add privacy and style to an existing deck. The structure frames the space, giving it more of an outdoor feel. And it can block the sun and provide shade on a hot day. The fire pit is a contemporary point of focus for a deck and perfect for romantic evenings with a bottle of wine. Remodel with new stone veneer for a modern look. Stacked stone or marble looks modern and will flatter any deck space. Of course, double check local ordinances to makes sure an open flame is allowed at your residence. 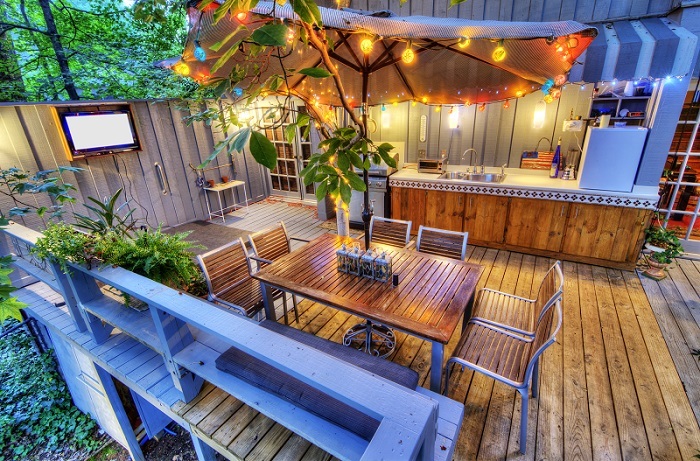 Remodeling your deck can give you the perfect entertaining space. As with any remodel, mistakes can increase costs and delay the project by months. If you don’t want to miss the summer season, a professional is your best bet for turning your design from vision to reality.